Bon Ku, in the emergency department at Jefferson University Hospital. A heart attack one minute. Mysterious stomach pain the next. A steady stream of fevers, headaches, and shortness of breath. As the safety net of the American health-care system, hospital emergency rooms are expected to be crowded, loud, and chaotic. Bon Ku, an emergency physician at Thomas Jefferson University Hospital, thinks there has to be a better way. For the last two summers, he has deployed teams of students with iPads inside Jefferson's busy emergency department, carefully mapping the movements of doctors, nurses, technicians, and patients. The goal of the project, a collaboration with the KieranTimberlake architecture firm, is to learn how emergency medicine could be improved through good design. "People ask me: 'Are you just trying to make the E.R. look prettier or polished, with the walls a more soothing color?'" he said. "No. You can design spaces to change the behaviors of people." Among the early results from the research: colorful "heat maps" suggesting that physicians spend too much time at computer keyboards at the expense of listening to patients, Ku said. A “heat map” shows the locations of five categories of people in the Jefferson emergency department over a 48-hour period: patients (red), doctors (purple), nurses (blue), other staff (green), and family/friends (yellow). That was no surprise, and certainly not unique to Jefferson, which typically gets at least 65,000 E.R. visits a year. Doctors and nurses nationwide have griped about the amount of time spent entering patient information into electronic medical records. But it has gotten Ku and his colleagues thinking about ways to alleviate the problem. Placing easy-to-use keyboard stations inside patient rooms, perhaps. Or better use of scribes — employees who document the care while the physician focuses on providing it. Ku, who majored in classical studies as a University of Pennsylvania undergraduate and later earned a master's degree in public policy at Princeton, has no formal training in design. But he is determined to get medical students thinking about it. The E.R.-mapping study is one of 10 design projects now underway in the Vault, the basement of a former Federal Reserve building in the 900 block of Chestnut Street that Jefferson owns. The lab is directed by pharmacist Robert Pugliese. One effort involves using a 3-D printer to make plastic models of patients' jawbones, helping surgeons to prepare for difficult reconstructive surgery. In another, student researchers use electronic wristbands to monitor the movements of children in playgrounds, in hopes of determining which structures are most likely to encourage physical activity. The emergency-department mapping project began when Ku saw a KieranTimberlake presentation of research it had conducted at JFK Plaza: how people use the park, where they sit, and where they stand. Billie Faircloth, a partner and research director at the architecture firm, recalled that Ku approached her afterward. "He said, 'I need this in my emergency department,' " she said. Architects are used to interacting with people who have no formal design training. Listening to clients' needs is a core part of the job, after all. But in Ku, Faircloth and her colleagues found someone who was unusually insightful about the potential for good design. "He talked very clearly" about what he hoped to achieve, Faircloth said. "He is basically looking at design from multiple perspectives." Jefferson did not hire KieranTimberlake to renovate the space. The firm offered its services purely for research purposes. Ku and his students are still sorting out what the results mean, and how they might lead to improvements. The hospital's emergency department treats about 180 patients a day and at least seven every hour, though there is a lot of ebb and flow. Mondays are busiest, with a logjam of untreated ailments that has built up over the weekend. Regardless of the day, volumes tend to be highest from lunchtime until 2 a.m. The space is divided into two wings, and, therefore, could serve as a living laboratory for testing different approaches for providing care. The larger "A" side has the more traditional E.R. configuration, with one central station for doctors and nurses, surrounded by patient rooms. The smaller "B" side is decentralized, with nurses separated into "pods" — each surrounded by a cluster of four patient rooms. Ku likes the B side because it tends to be quieter. But neither side has a good spot for providers to decompress. Ku's solution? "I go to the bathroom," he said. Ultimately, he would like to test which seating arrangements and other design elements might improve patient outcomes. A recent study funded by the Robert Wood Johnson Foundation suggests that better design can, indeed, have an impact. Among the findings: Hospitals with shorter distances between delivery rooms were less likely to deliver babies by cesarean section. When rooms were arranged in a compact cluster rather than strung out along a long hallway, providers could work more efficiently, apparently reducing the pressure to move patients through the system more quickly by performing C-sections, the authors wrote. KieranTimberlake developed the iPad tool that was used to map the Jefferson E.R., and it was customized for a health-care setting with input from Ku and his colleagues. 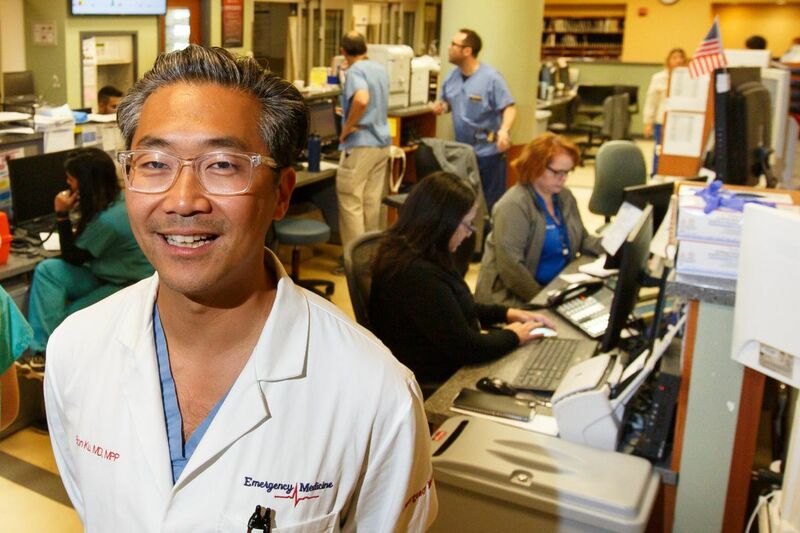 Ku, the assistant dean for health and design at Jefferson's Sidney Kimmel Medical College, wants to eventually make the tool available to hospitals anywhere. From what he can tell, there is far too little study of hospital spaces once they are built. "The science of how we build new health-care facilities," he said, "should be as rigorous as the science of how we develop new drugs or therapy." Bon Ku (center) and medical student Allison David (far left) are studying how to improve emergency medicine with better design.